Summary: Katherine Boatman loses her bearings after her grandmother dies on New Years Eve. The new millennium brings change for Katherine as she begins her last semester of high school, drowning in grief and trying desperately to find a reason to go on with life. A new friendship at school with a girl named Marie opens her up the world of punk music, and to truths about herself Katherine was previously unaware. In the midst of questioning her sexual preferences, Katherine is also dealing with losing the friendship of her best friend, conflict and apathy from her parents, as well as keeping up with her schoolwork. Unsure of a future where she admits she is gay, Katherine takes things one step at a time, finding support and love to be who she is. Review: After her grandmother dies, Katherine finds herself isolated and friendless as her parents are busy with their jobs and her former best friend is focussed on her boyfriend and hating Katherine for dating her brother. When she is befriended by Marie, Katherine begins to feel things she wasn’t expecting, and friendship turns to love. I liked the setting of Toronto, especially the part about the Bloor Viaduct. The picture of it on the cover is instantly recognizable. Katherine’s comments about the Luminous Veil were insightful and sadly accurate because its installation did not affect the overall suicide rates in Toronto. When We Were Good is about a girl trying to find meaning after the death of a loved one. Katherine takes finding a 50 dollar bill as a sign that she needs to do something good, but struggles for the entire book to figure out what it might be. I was surprised she would actually jump on the subway tracks to retrieve the $50, especially since her parents were rich and would have definitely given her another one. The premise behind using the $50 to cheer up Marie though was sound. There’s a quote from the Talmud that reads “whoever saves a life, it is considered as if he saved an entire world.” In this case, Katherine and Marie end up saving each other. My favourite part though was when Katherine reads Runaway Feeling by Tracy-Anne Sugar and it changes her life as she recognizes herself in it. It’s a prime example of bibliotherapy, because Katherine describes it as “a cheat sheet for my soul.” What a perfect way to describe a book that touched you on a personal level. I wish I had thought of it, and I wonder who Suzanne Sutherland’s Tracy-Anne Sugar was. “Marie was gay. A lesbian. Marie was too much too close too soon. “Getting away from the emptiness of things – wealth, relationships, love, whatever. Nothing feels special when you have it all the time. So maybe the only way to make a life seem special is to cut it short. It seemed so perfect and so obvious. An inevitability, a perfect, symbolic solution. 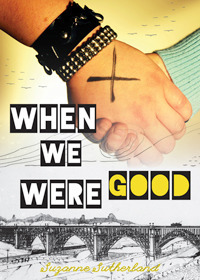 When We Were Good by Suzanne Sutherland is published by Sumach Press, (2013).